Over the past two decades, a Buddhist contemplative tradition spawned in India and Tibet thousands of years ago has found its way into living rooms and classrooms all across the West. Millions of people in the U.S. and Europe now meditate regularly, whether via online apps or guided in person courses. Schools, corporations and prisons have begun to offer regular meditation trainings. Even the U.S. Marines have implemented the practice given preliminary evidence of benefits for attention, mood and possibly PTSD. So what is meditation, what do we actually know about its benefits, and what kinds of questions still need to be answered? We scoured the literature, read the meta-analyses and talked to scientists studying meditation in labs around the country. Here is what we found out. The terms meditation and mindfulness are sometimes used interchangeably, but the first refers to a complex family of Eastern cultural practices for training mental attention, and the second is the quality of mind that one of these traditions, called mindfulness meditation, aims to cultivate. Mindfulness meditation is the tradition most widely studied by researchers today, but other meditation traditions include mantra meditation, transcendental meditation, yoga, tai chi and chi gong. There are two primary types of mindfulness meditation in the Buddhist tradition. The first is Vipassana, which translates as “insight,” and is meant to promote a clear awareness of our internal experience as it occurs, without judging or reacting to that experience. The second is Samatha, which is synonymous with “concentration” or “tranquility,” and it encourages focusing the attention on a single thing — the breath, a mantra — and limiting wandering thoughts. A third popular kind of mindfulness meditation, called loving-kindness meditation, aims to cultivate compassion. How Do Scientists Study Meditation? Meditation’s popularity among the public and among research scientists really took off in the early to mid 2000s, according to Nicholas Van Dam, a research fellow at the School of Psychological Sciences at the University of Melbourne, Australia, who studies meditation. 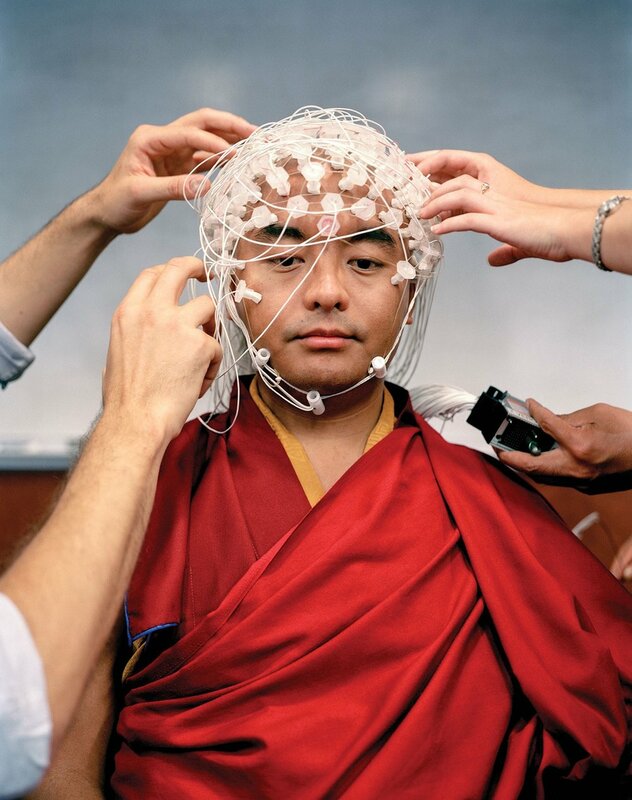 The 14th Dalai Lama Tenzin Gyatso had been promoting the study of meditation since the late 80s, when he partnered with neuroscientist Francisco Varela and lawyer and entrepreneur Adam Engle to create the Mind & Life Institute in Charlottesville, Virginia, a non-profit focused on the study of the mind. But Van Dam says it was Mind & Life’s 2004 launch of the Summer Research Institute, in Garrison, NY, which really got things going, and granted broader legitimacy to the subject. The Summer Institute brings together scholars from many different disciplines each year to try meditation in a retreat setting and discuss the science behind it. The gold standard today for mindfulness-based intervention studies is modeled after an 8-week course in mindfulness-based stress reductionpioneered by Jon Kabat Zinn in 1979 at the University of Massachusetts. That program, initially developed to treat chronic pain patients, involves 20 to 26 hours of formal meditation training during eight weekly group classes (1.5–2.5 hours/class), one all-day (6 hours) class, and home practice (about 45 minutes/day, 6 days/week). Formal training addresses focused attention on the breath (Samatha meditation), open monitoring of awareness in “body-scanning” (Vipassana meditation), loving kindness meditation, and gentle hatha yoga. Dozens of spin-offs of the MBSR have been spawned. These include mindfulness-based cognitive therapy (MBCT) for treatment of depression, mindfulness-based relapse prevention (MBRP) for drug addiction, and mindfulness-based relationship enhancement (MBRE) for improving relationship functioning. Scientists have also developed intensive retreat programs that last from three days to three months, three to four day lab-based interventions, as well as briefer mindful attention experiments. And there is a glut of Internet and smartphone based mindfulness meditation apps, including Headspace, which has over 30 million active users worldwide, promotes and participates in scientific research, and recently declared its intention to seek FDA approval for the treatment of chronic diseases. Headspace is currently working on several highly ambitious large-scale meditation trials. One workplace study with the British National Health Service of 2,000 participants across multiple sites will examine the app’s impact on health and business outcomes including stress, anxiety, depression, and sickness absence. A University of California-system study led by UCSF will recruit employees from multiple campuses to examine how Headspace use influences various metrics of health and well being. And a UK College of Policing study will recruit 3,000 police officers to measure the meditation app’s influence on stress, productivity, and engagement. Something as subjective as mindfulness meditation does not yield easily to the tools of science, and concerns about the quality of research in the field have repeatedly been raised over the past two decades. Most recently, in a literature review titled “Mind the Hype” published in October in Perspectives on Psychological Science, an interdisciplinary group of 15 scholars found that most studies of meditation are poorly constructed, plagued by inconsistent definitions of meditation, small sample size, weak controls and short follow up times. “When you do a comprehensive assessment of everything that’s out there, the story is basically that we just don’t know enough yet,” said lead author Nicholas Van Dam of the University of Melbourne. Only nine percent of the studies reviewed used active controls, for instance. But that doesn’t mean that all of the findings on meditation are bogus. In the early 2000s, there was a dramatic increase in randomized controlled trials that compare mindfulness interventions to treatment as usual, wait-list control, or active comparison interventions, according to a literature review published in 2016 by J. David Creswell, a professor of psychology at Carnegie Mellon University. A wait-list control is a standard control group in psychotherapy research, where a group of participants assigned to a waiting list receives the intervention after the active treatment group does, while active comparison interventions are ones that are similar in structure but without the actual meditation component, such as an eight-week course in relaxation or health enhancement. “Researchers have made impressive efforts to develop active treatment comparison programs that control for non-mindfulness-specific treatment factors,” he wrote, such as group support, home practice exercises, relaxation and placebo expectancies, i.e., prior belief in the power of meditation. And as the field matures, better funding is allowing for larger sample sizes and longer follow-up periods, according to Eric Loucks, a meditation researcher at Brown University’s School of Public Health who did not participate in the Mind the Hype review. In the future, he expects to see more studies featuring multi-site randomized controlled trials, long-term follow-up of at least one year, more objective measures of outcomes, and replication of findings by independent groups, he wrote in an email. “I believe the field of mindfulness holds strong potential to influence health,” he wrote. Can Meditation Improve Mental Health? Mental illness has historically been one of the most difficult categories of sickness for medicine to successfully treat, and this is one area where mindfulness meditation seems to hold the greatest promise. The most definitive clinical benefit researchers have thus far been able to link to mindfulness meditation intervention is a significant reduction in depression relapse. An eight-week course modeled after Jon Kabat Zinn’s MBSR program that combines mindfulness meditation with cognitive therapy has been found in repeated studies to reduce the incidence of relapse for people at greatest risk for it — those with a history of at least three episodes of depression. A 2004 follow-up to the initial study, conducted over two decades ago, found MBCT was more effective than cognitive therapy alone or standard psychiatric medication by approximately 50 percent at 12 months and two years. A more recent review and meta-analysis, published by the University of Oxford’s Willem Kuyken and colleagues in JAMA Psychiatry in 2016, provided further support for this finding. Even ordinary depression and anxiety disorders seem to yield to MBCT treatment — though it is no better in this regard than medication. (These findings are significant, however, when you consider that many people have avery hard time getting off of antidepressants.) “If mindfulness-based interventions work about comparably to CBT or antidepressants, that’s not necessarily a bad thing,” said Van Dam. “It may be that people like the mindfulness stuff better. If that’s the case, what you need to show is that people will commit and follow through with the intervention better than the other therapies.” MBCT is now endorsed by the American Psychiatric Association for preventing relapse in patients who have suffered three or more episodes of depression, but not for regular depression and anxiety. The U.K. National Institute of Health and Clinical Excellence also recommends it over more conventional treatments for preventing depressive relapse. The picture is more mixed when it comes to the mental health benefits of straight mindfulness-based stress reduction courses, without the cognitive behavioral component. One widely-cited meta analysis published in Jama Internal Medicine in 2014 by Johns Hopkins Medicine’s Madhav Goyal and colleagues reviewed 47 trials with 3,515 participants and found moderate evidence that eight weeks of mindfulness-based stress reduction practice could improve anxiety, depression and pain, but that it did no better than exercise, drugs, or other behavior therapies. They also found low evidence of improved stress/distress and mental health quality of life and low or insufficient evidence of improved mood, attention, substance use, eating habits, sleep, or weight. Further complicating the story, some researchers have identified potential adverse effects of mindfulness meditation, though the study of these effects is only in its infancy and the incidence is so far low. Over 20 individual case reports and observational studies have identified various forms of clinical deterioration associated with mindfulness meditation, including meditation-induced “depersonalization” as well as retriggering of trauma, mania, panic and psychosis. As a result, numerous authors have recommended that individuals with any indications of suicidality, schizophrenia spectrum disorders, bipolar disorder, post-traumatic stress disorder, depression, and risk factors for psychosis, should not participate in a meditation-based intervention that is not specifically tailored to one of these conditions. An ambitious seven-year study is currently underway to look at the impact of meditation on the mental health of 7,000 teenagers aged 11 to 16 from 76 secondary schools, given that many mental disorders begin to emerge at these ages. The research study is led by Oxford’s Willem Kuyken in partnership with other psychologists and neuroscientists from Oxford University and University College London (UCL) and is funded by The Wellcome Trust. Starting in 2016, around 3,000 British youth received training in mindfulness techniques via a 10-week course involving a weekly 30-minute lesson plus up to 20 minutes’ daily home practice. A second group of around 3,000 individuals received standard personal, health and social training lessons. Over the following two years both groups are being monitored for depression and other mental disorders. Another 600 students will be tested by Professor Sarah-Jayne Blakemore at UCL before and after mindfulness training to assess self-control and emotional regulation. Blakemore wants to find out exactly at what point during adolescence, a period of great reorganization of the prefrontal cortex, mindfulness has the most effect, she recently told The Guardian. At the other end of the age spectrum, a five-year $15 million National Institutes of Health study launched in 2015 is examining strategies, including meditation, that can help older adults prevent or reverse age-related cognitive decline. The study team, led by Eric J. Lenze, includes a cross-disciplinary group of 14 researchers at the Washington University School of Medicine in St. Louis from fields such as psychiatry, medicine, radiology, neurology, biostatistics, physical therapy, and occupational therapy. The researchers recruited 580 people over age 65 who have significant problems with thinking and memory, but have not been diagnosed with clinical dementia common to conditions like Alzheimer’s disease. Another $3 million, five-year National Institutes of Health study launched in 2015 is looking at stress management strategies, including mindfulness meditation, for reducing loneliness in older adults. Another large-scale interdisciplinary study funded by the National Institutes of Health and conducted by 12 basic science and clinical mindfulness researchers at four U.S. universities — Harvard, Brown, University of Massachusetts, and Georgetown — will attempt to examine how mindfulness influences self regulation, which is critical to a number of health problems influenced by behaviors like excessive eating, lack of physical activity, addiction and poor adherence to medical regimens. The project, to be conducted in four stages, will attempt to identify behaviors associated with self regulation that can be manipulated through therapies, identify the therapies that can influence them, and ultimately pilot test these in two separate mindfulness-based intervention trials for managing chronic medical conditions: the Mindfulness-based hypertension study and the mindful primary care study. Does Meditation Improve Physical Health? How states of mental perception influence physical health has become a hot topic of research in recent decades. In particular, researchers have found that high levels of cognitive stress can contribute to poor health and mental health — as can the very perception that stress is detrimental to health. In September of 2017, the American Heart Association recommendedmindfulness meditation for lowering heart disease risk. That recommendation, published in the Journal of the American Heart Association, was based on evidence that mindfulness meditation may reduce stress and help with other metrics of cardiovascular risk, such as smoking cessation, blood pressure reduction, insulin resistance and metabolic syndrome, endothelial function, and myocardial ischemia. The authors noted that while the evidence is modest and quality of research is mixed, the intervention carries low costs and low risk. Emerging evidence suggests that other stress-related illnesses may also respond to mindfulness meditation. One randomized controlled trial of 154 patients found that mindfulness meditation treatment could reduce the number of self-reported sick days and the duration of illness during flu season relative to a no treatment group. Initial randomized controlled trials also suggest mindfulness interventions may reduce symptoms and improve quality of life for some stress-related conditions, such as fibromyalgia, IBS, breast cancer, and psoriasis. And in one recent study, researchers including Dr. Elissa Epel, professor in the Department of Psychiatry at the University of California, San Francisco School of Medicine, examined a cohort who had undergone an intensive one-month insight meditation retreat and found improved telomere regulation, which is associated with cellular aging and may play a role in linking psychological stress to disease. Chronic pain was one of the first conditions that mindfulness meditation was used to treat, back in the 1980s, and some researchers have found evidence in brain scans that mindfulness meditation influences the emotional suffering associated with pain if not the physical sensation of pain itself. In one of the largest mindfulness intervention randomized controlled trials to date, with 342 participants, MBSR reduced functional limitations due to pain among chronic back pain participants at both four-month and 10-month follow-ups (61%) compared to treatment as usual (44%). It was not found to be superior to a matched cognitive behavioral therapy program (58%), however. In a separate randomized study of 75 healthy human volunteers, a sham mindfulness meditation procedure used as a control did not provide the same pain relief benefits as actual mindfulness meditation training. Immune system function may also benefit from mindfulness meditation, if preliminary findings from three well-controlled studies hold up. These studies found reduced biomarkers of inflammation associated with mindfulness meditation interventions: circulating blood markers of C-reactive protein,interleukin 6, and the stress-induced inflammatory skin flare response. Another three randomized controlled trials found that mindfulness meditation interventions could reduce declines or even increase counts of certain white blood cells critical to immunity in stressed AIDS patients, both at post-treatment and follow-up periods up to nine months. How substance abuse is influenced by meditation is also a good subject for further research. In one of the largest studies to date on this subject, 286 substance-abusing individuals were randomly assigned at a treatment facility to either MBRP, a cognitive-behavioral relapse prevention program, or a 12-step program. Researchers then monitored their self-reported substance abuse during a 12-month follow-up period. Compared to the standard 12-step treatment group, both the MBRP and cognitive-behavioral relapse prevention groups demonstrated a 54% reduction in drug relapse and a 59% reduction in relapse to heavy drinking. The cognitive-behavioral relapse prevention program delayed the time to the first drug relapse relative to the MBRP program, but the MBRP program appeared to reduce the number of drug use days at the 12-month follow-up time. The findings were published in Jama Psychiatry in 2014. What’s the Right “Dose” of Meditation? “We really don’t know much at all about how much practice people should do daily, or for how long, and what the benefits are over the life span,” said Anthony P. Zanesco, co-author of the University of California-Davis study. After the treatment, participants were found to have improved tonic alertness (the ability to remain alert over time) as well as orienting towards a visual target in comparison to controls. In a recent seven-year follow-up study, these performance improvements were found to have been partially sustained. In particular, aging-related declines in response accuracy and reaction time were reduced for those who continued to meditate regularly during the follow up period, with better results associated with more time spent meditating. One drawback to the study design is that it is a special sort of person who is going to be able and willing to dedicate three months of their lives to a meditation retreat. In individual case studies, Buddhist monks who have been practicing for decades have demonstrated extraordinary skills, such as an ability to alter body temperature by small amounts, for instance, or suppress the startle response. But it is difficult to study such skills longitudinally — i.e., before and after 30 years of monkhood — and difficult to know, similarly, to what extent someone drawn to that lifestyle might already have certain unusual neurological features. “What leads someone to be a monk in the first place?” asks Van Dam. “They live in a monastery. Their meals are prepared for them. Their job, essentially, is to meditate…that doesn’t necessarily then translate into your average Joe that comes in off the street and wants to pick up meditation to stave off Alzheimer’s.” Van Dam is now working on comparative study of individuals from different monastic traditions — Jesuit, Benedictine and Buddhist monks — in an attempt to isolate the effects of living as a monk from the practice of meditation. Meditation style also matters, and more work needs to be done to isolate the effects of each of the major styles. Though studies of mindfulness meditation’s influence on levels of the so-called stress hormone cortisol have yielded mixed results, in one nine-month study that included three distinct training modulesand a control group, Veronika Engert of the Max Planck Institute for Human Cognitive and Brain Sciences, in Leipzig, Germany, and colleagues, found that training in loving-kindness meditation and another form of prosocial meditation cut cortisol levels by up to 51 percent during a stress task. Attention-based meditation practice did not influence cortisol levels. Participants in all three kinds of mindfulness meditation training reported feeling less social stress, however. The study was part of a major ongoing meditation research project at Max Planck Institute called the ReSource project. Scores of neuroscientists have tried peering into the brains of advanced and beginner meditators over the past several decades with fMRI (functional magnetic resonance imaging) to find out more directly how mindfulness meditation may influence our mental clockwork. This discipline has come to be known as contemplative neuroscience. Despite significant limitations to neuroimaging research both broadly speaking and in the specific context of the study of meditation, meta-analyses suggest the practice might cause neuroplastic changes in the structure and function of brain regions involved in regulation of attention, emotion, and self-awareness. Richard Davidson was one of the first to study the brains of expert meditators, such as Buddhist monks. One study from his lab in 2004 suggested that very skilled meditators with thousands of hours of practice had elevated levels of gamma oscillations in their brains even when they were not meditating compared to gender and age controls, Davidson told neuroscientist Sam Harris during an appearance on his podcast Waking Up. Such oscillations tend to be associated with flashes of insight. Connections between the dorsal lateral prefrontal cortex (DLPC) — involved in executive function — and the amygdala — which regulates the experience of emotion — have also been found to be strengthened, said Davidson. Likewise, fMRI studies have shown stronger connections between the DLPC and features of default mode network — in particular the posterior cingulate cortex (PCC) — that are associated with self-narrative among experienced meditators versus controls, according to Davidson. Whether these neurological features are produced by years of meditation or predispose a person to take up intensive meditation training is not understood, nor do scientists know yet how these differences in brain structure might translate into behavior. Even the brains of beginner meditators have been shown to experience training-related changes. For example, in 2010, Sara Lazar, a neuroscientist at Massachusetts General Hospital and Harvard Medical School, and colleagues examined the brains of a group of just 16 meditation–naïve participants before and after an eight-week MBSR course, and compared them against 17 wait-list controls. Localized analyses confirmed increases in gray matter concentration within the left hippocampus, which is associated with memory. Whole brain analyses identified increases in the posterior cingulate cortex, the temporo-parietal junction, and the cerebellum in the MBSR group compared to the controls, regions involved in learning and memory processes, emotion regulation, self-referential processing, and perspective taking. Even three days of mindfulness training can reverse the effects of stress on the amygdala, a part of the brain involved in the regulation of emotion, according to findings from a randomized controlled trial published in 2015 by Adrienne Taren, a researcher studying mindfulness and brain structure at the University of Pittsburgh. But, as elsewhere in the field, further studies with larger sample sizes and longer follow-up are needed. Since the time of Aristotle, humans have been asking whether it is possible to improve our cognitive capacities, whether our memory, attention and ability to cope with stress are set by adulthood or can be improved upon with mental training. The father of American psychology, William James, tried to address this question 100 years ago when he asked some of his research assistants to memorize poetry to see if it could improve their memory span. It’s a question we’re still trying to answer today, and a lot of researchers and individual meditators have their hopes pinned on mindfulness. We still have a ways to go to find out. Δείτε το πρωτότυπο άρθρο εδώ.